YWCA Greater Cleveland honored three women from Case Western Reserve University and two with secondary appointments at the university at its 35th Annual Women of Achievement Awards luncheon on May 16. School of Medicine Dean Pamela Davis earned the Women of Achievement award, a prestigious honor that recognizes women in Cleveland with outstanding leadership qualities and commitments to their careers and communities. Award recipients also exemplify YWCA’s mission of eliminating racism and empowering women. 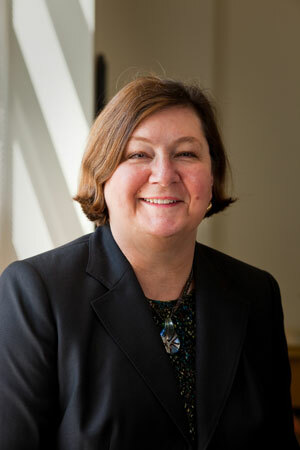 Davis became the School of Medicine’s first female dean in 2007 and is one of fewer than 20 female medical school deans in the U.S.
Additionally, YWCA named School of Medicine Professor and Associate Dean of Graduate Education Alison Hall one of its Women of Professional Excellence. For this award, employers recognize the contributions of women within their organizations. In her position, Hall has created relationships and coordinated initiatives in the school’s training programs, and she spends time mentoring individuals new to biomedical science. Other Women of Excellence with a connection to the university included Francoise Adan, clinical assistant professor in the Department of Psychiatry and co-medical director of the U.S. Connor integrative Medicine Network at University Hospitals Ahuja Medical Center, and Erika A. Whitney, senior clinical instructor and a physician at University Hospitals Geauga Medical Center. Finally, Abigail Erinc, a rising junior biomedical engineering major, was one of two area students named this year’s Dr. Jennie S. Hwang award winners. The award recognizes an outstanding sophomore female who is majoring in a science-, engineering- or technology-related discipline. Erinc, who plans to earn a PhD in biomedical engineering with a focus on biomechanics, bone loss and methods of bone regeneration, has earned the dean’s high honors every semester. She works as a research assistant and a supplemental instructor for calculus for science and engineers, is a member of WISER and serves as a peer mentor for first year women in science and engineering.